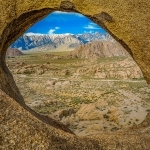 In the late nineteenth century, a cattle ranching homestead flourished here. 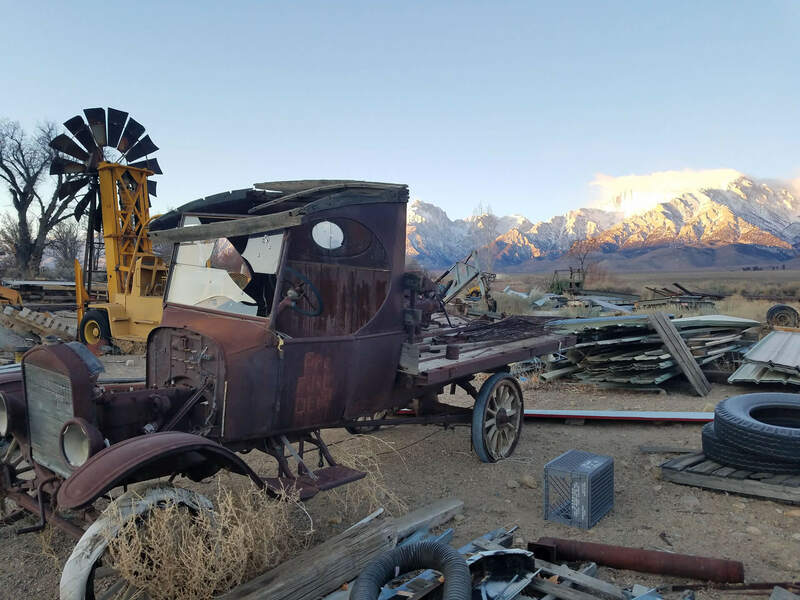 In the early 1900’s the town of Manzanar grew to be a thriving pear and apple orchard community. 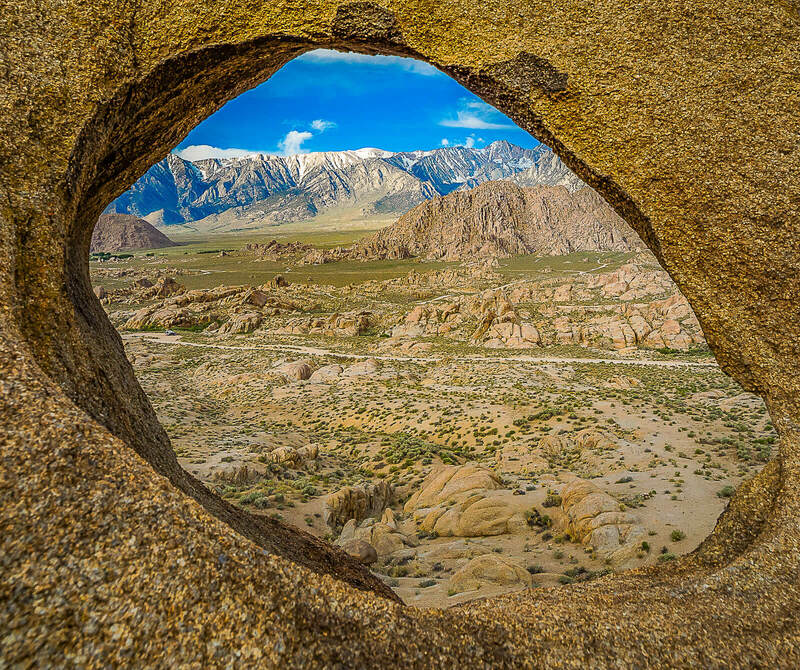 By 1913, the city of Los Angeles completed its aqueduct and owned 95% of the Owens Valley. 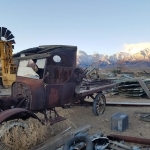 The town of Manzanar was then abandoned and the land remained vacant, until March 1942. Two months after Pearl Harbor was bombed, President Roosevelt signed an Executive Order calling for all those of Japanese ancestry to be placed into relocation camps. Manzanar was one of those relocation centers, built initially as a temporary center it became the first permanent relocation center in the United States. 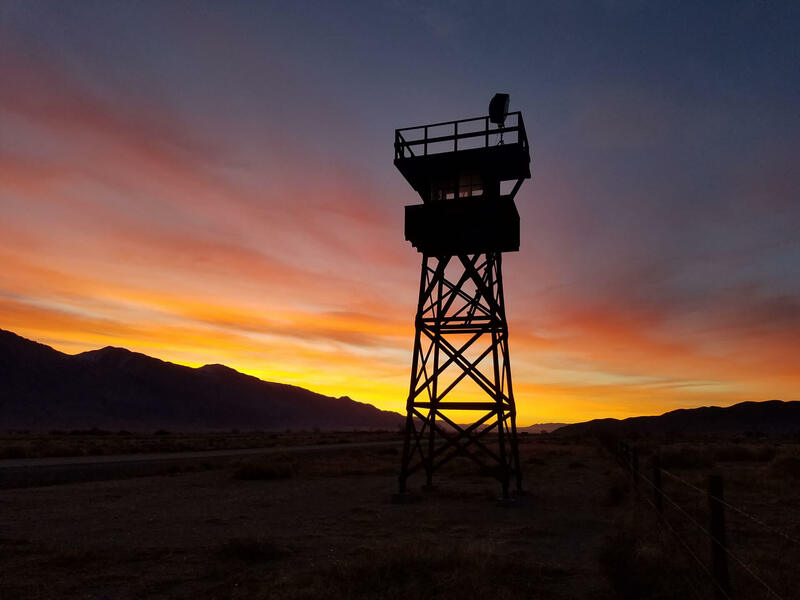 The entire Manzanar detention facility encompassed 6,000 acres. The camp itself consised of 36 blocks of wooden barracks confined within a one-square mile area. In addition to the detention camp the facility consisted of adjacent agricultural use areas, a reservoir, an airport, a cemetery and sewage treatment plant. Of this area a rectangle of approximately 550 acres, containing the living area for the internees and various administrative facilities, was enclosed by barbed wire fences and secured by guard towers. The 10,000 internees sought to establish some semblance of normal life and beautified the barracks with gardens and ponds, and tendered the orchards remnants which still remain today. Manzanar was the only camp to have an orphanage, which housed 110 children. When the camp was closed in late 1945, the wooden barracks and administration buildings were sold at auction and removed from the site. Among the visible remains is the camp auditorium, a large wood-frame building. In addition, the stonework shells of the pagoda-like police post and sentry house and portions of other building in the administrative complex remain,as do concrete foundations and portions of the water and sewer systems throughout the camp. 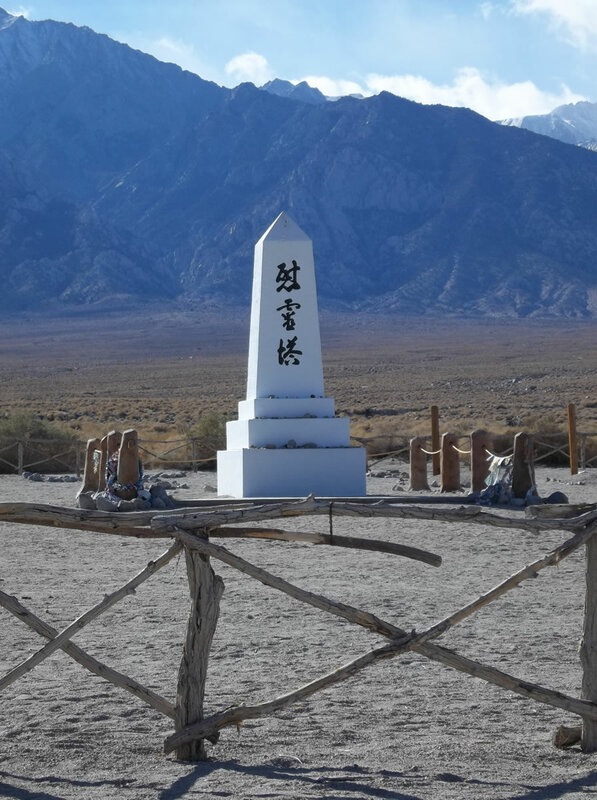 An annual pilgrimage, sponsored by The Manzanar Committee, is held on the last Saturday of April near the cemetery monument. Former internees, their descendants, friends and general public join for a day of remembrance, education and re-dedication of the cemetery in religious (Christian and Buddhist) Ceremonies. As part of the Save America’s Treasures millennium grant , the historic perimeter barbed wire fence that enclosed the living area of the camp will be rebuilt. Plans are underway to adaptively restore the Auditorium, reconstruct one of eight guard towers, at least one barrack and internee-built garden and ponds. Significant collections of photos, drawings, painting, and artifacts associated with Manzanar have been gathered over the years. 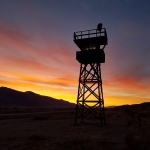 Many of these can be seen in the Manzanar National Historic Site Interpretive Center or in the Eastern California Museum, located five miles north of the camp in the town of Independence.